Lower price now includes a like new 2017 Polaris General 1000 (see photo) valued at $18,500.00. 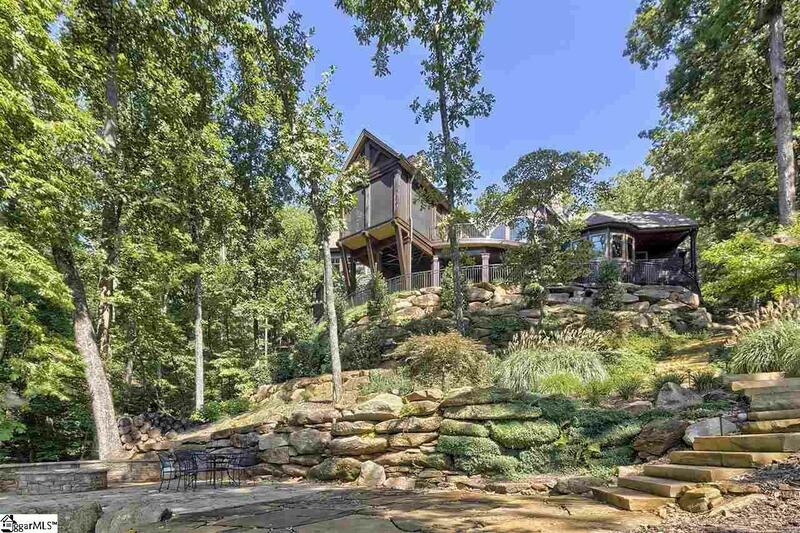 Spanning the breadth of Keowee Falls most preferred cove, this custom waterfront home and its included adjacent lot provide 250 feet of shoreline. Viewed from the water, the home soars atop a sloping landscape bedecked with multiple levels of boulder-lined retaining walls and slate paths. The approach by land winds down a cobblestone-inspired driveway to a water feature with falls spilling some 30 feet down the natural hillside. Facing the falls, the homes weighty stone and rich brown cedar facade flawlessly harmonize with the surrounding hardwoods. Even before opening the front doors, youre greeted with a preview of Lake Keowees turquoise waters, and that vista swells as you enter the great room with its wall of arched windows gracefully framing the scenery beyond. 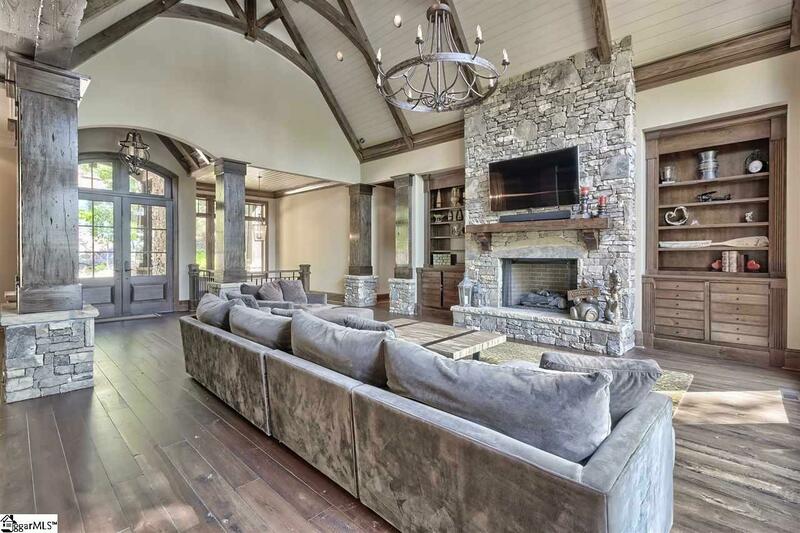 A stone fireplace anchors one end of this airy room, with the other open to the kitchen. Embodying "heart-of-the-home spirit, the kitchen features an island substantial enough for a crowd, Wolf appliances, a walk-in pantry with generous counter space, and an adjoining keeping room with separate fireplacea perfect spot for cozying up with a good book. The adjacent dining room has French doors to the front porch. Accents and mouldings throughout the home exhibit impeccable craftsmanship. Massive stone and rough-hewn timber columns border the great room, and heavy ceiling beamsarched in the great room, vaulted in the keeping room, horizontal in the kitchenhighlight each areas unique architecture. The homes main level culminates with a cherry-paneled corner office on one end and the luxurious master suite on the other. With a floor-to-ceiling bow window overlooking the lake, the master bedroom opens to a private covered porch. His and her vanities, a jetted tub, and a shower stretching the width of the room equip the master bath to rival any spa. Stairs located near the three-car garage entrance lead to a spacious second-level bedroom suite. The lower level centers around a sprawling gathering/game room that includes a wine cellar, tasting area, kitchenette and impressive bar. Stone walls with stucco accents evoke old-world soul. An arched entrance accesses the wine room and tasting area, complemented by a vineyard-themed fresco. Two additional bedroom suites, one of which leads to a private patio, and a bunkroom provide ample guest accommodations on the lower level. Outdoor living spaces comprise a main-level expansive sun deck and screened porch with fireplace and built-in grill, a lower-level patio with grilling kitchen, and a waterside terrace with fire pit and benches. Two covered docks (one belonging to each lot) are connected by a pathway and small footbridge, and a beach area is centrally located along the water frontage. A variety of both flowering and evergreen plantings that extend to the waters edge ensure that this homes exterior is as remarkable as its interior; both reward those fortunate enough to see them in person. The Cliffs at Keowee Falls offers a full suite of country club amenities, including a Nicklaus Signature golf course, miles of integrated trails, clubhouse with multiple dining venues, and a no-fee, resort-style Sports, Activity, and Wellness Park.